We should all understand by now that Windows 10 is the last version of Windows. When all the previous versions, up to and including Windows 7, have all lost Microsoft support, maybe we can merely call it Windows, without any numbers attached to it. Life will be much simpler that way. This week’s Quick Tips article will try to eliminate some of the confusion regarding Editions, Versions, and Builds. Editions are easy to understand and most people, when asked which operating system they are running, answer with the Edition type. As we all know, there have been many editions created by Microsoft over the years. There are and have been Home editions, and Pro, Ultimate, Second, First, Enterprise, Server, Education, S, IoT, Mobile, and the painful list goes on seemingly forever. I personally like things simple and this is most definitely not. 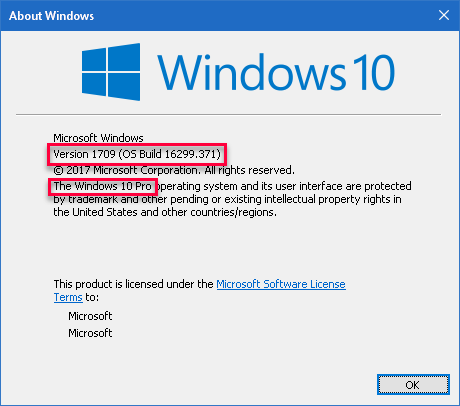 Windows 10 is now updated a couple times each year and given version numbers. The current version, as of September, 2017, is 1709. This breaks down to the year (2017) and the month (09). These are not absolutely accurate as you may well know. Version 1709 was not released in September. The next version will be 1803, but we are already well past March. Interestingly, Microsoft passed on releasing this version recently in favor of getting rid of some nasty bugs their unpaid beta-testers found (read, Insiders). I would much rather have a new version released later than sooner if it means a glitch-free environment. Thank you, MS! 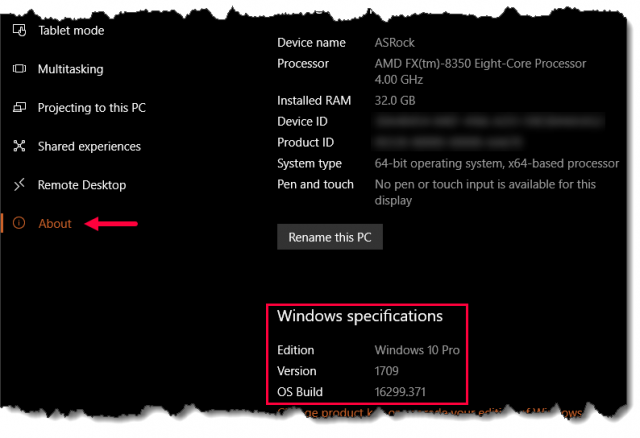 You can see that the latest Build was delivered to us on April 10th (Patch Tuesday). The Knowledge Base (KB) numbers in the right-hand column are links to specific information regarding each build. This screen grab was taken at this Microsoft Windows 10 Release Information page where you can probably get more information than you care to know. be released to the public. BTW I am running version 6.3 build 9600 on this PC. I am surprised at how many pc users, at least in my circle, have no idea on how to use “winver”. I haven’t had a chance to check resources yet today, but at this moment, I have no idea about 1803. With luck maybe MS will just skip 1803. In this sort of article it would be helpful if you made the point to suggest that when people ask for help with Windows 10, and Office, they should include the VERSION and full BUILD numbers. Even though updating is out of user control I’ve been seeing a lot of variation in build numbers being used. Often it happens because an update error blocks subsequent updates. I’m getting a lot of help requests from people who are getting notices from MS that the version they are running, Version 1607 is no longer supported. Windows update is constantly downloading the failed update, running it, backing out after failing repeatedly. But with all of their automation MS does not give the user timely notice that this one update is constipating the whole update system. All Quick Tips articles are generally focused on Windows 10. Products like Office are an entity unto themselves and have their own version and build schemes, as do many other services provided by Microsoft. You are right when you say that people seeking help in a given area should provide information specific to their platform if they expect to receive knowledgeable assistance. The unfortunate truth, and through no fault of their own, is that most folks simply aren’t aware of these intricacies. It is our job to politely inform them and to ask the proper questions, and to explain how to find the needed information. The recent kerfuffle with Windows updates over the past few months has, more than ever, encouraged me to defer system upgrades for at least a couple of weeks, if not longer. The latest delay in deploying 1803 has given me a slightly renewed confidence in Microsoft’s desire to avoid a repeat of the previous buggy releases we have all come to disdain and fear. For the time being, I will still defer upgrades until I am reasonably sure most of the nasties have been beaten out of the carpet. Incidentally, we do have control over when these updates will be installed on our systems. Many articles on this very subject have been published right here on DCT. You can click on the Magnifying Glass icon at the top of any page to run a search for those articles. Since using Windows 7 from day 1, an excellent product from Microsoft but I get the feeling that the Microsoft Corporation have allowed the ‘apprentices’ to build and run Windows 10. Thankfully with a vast amount of computer experience I was able to perform a System Restore from a disasterous update. At different times to replace my picture thumbnails after they were turned into Irfanview icons, reconnect the sound to my sound system and solve other annoying ‘glitches’. I am pleased that I was able to put Windows 10 on one hard drive and Windows 7 on another hard drive on my desktop PC. Thanks also Richard for your informative advice. I have been fortunate in that there have not been many mishaps due to installing Windows 10 on any of my computers, but then I am not the first to jump on the update bandwagon and do try to stay as far away as possible from Microsoft’s “rings”. Installed W10 1709 Build 16299.402 on my two W10 PC’s. First one was a disaster, trying to install from Windows Update. Update got hung-up about half way through and PC just stopped working. I finally restored W10 with a Easeus system image. I downloaded the update through MUC this morning and installed the standalone. Everything is back to normal. Always do a back-up or a system restore before applying W10 updates. I installed .402 this morning and everything went well. I feel lucky. You are absolutely right, Daniel– backups are a necessary form of self-protection these days.